With Taste of Toronto coming up this weekend I thought it would be fitting to write about another food festival in Toronto that is a little bit more under the radar which you may want to check out next year. 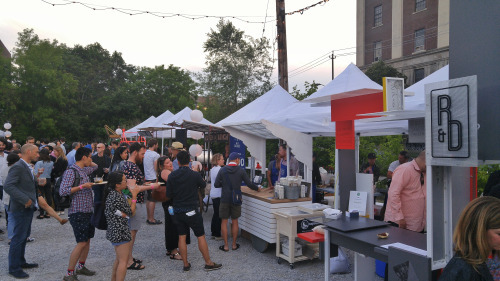 The Stop’s Night Market is an annual fundraising event in Toronto where a mix of local restaurants, beverage vendors, and artists all come together to transform a public space into a tantalizing feast for your senses over the span of two glorious nights in June. The unique thing about The Stop’s Night Market that sets it apart from all the rest is that it is all you can eat and drink! And when I say drink it’s not just water and pop. You can literally drink as much alcohol as you please throughout the entire night, beers, cocktails, and wines alike! However, most of the guests at this night market are not only here for the drinks, but for the delicious food that over 60 different restaurants have prepared. What’s the catch though that this is an all you can eat and drink affair? The ticket for admittance will cost you $100. However even with this price tag, the event sells out all the time and I for one am very glad that the organizers put out a limit on how many people are able to attend. To be perfectly honest, a lot of food festivals in Toronto has been an utter failure because of poor planning and execution. Do I have to remind you of recent examples such as the Mac and Cheese or the Grilled Cheese festival? If you do not pick the right venue and do not place a restriction on how many people can attend, what you will have is pure chaos where disgruntled guests will spend an hour waiting in line either just to get through the doors or partake in a small piece of food that was completely underwhelming and wasn’t worth the long wait. What Taste of Toronto and The Stop’s Night Market does so well is the ratio of food and beverage vendors to the guests. With over 60 restaurant booths and 20 local beverage vendors spread over the two days, the wait in line for me to get some food or a drink was a maximum wait of 5 to 7 minutes. In fact, the wait time for me probably averaged around 3 minutes throughout the entire night. The food kept pumping out so the lines kept on moving! As stated before, each ticket to get in will cost you $100 but it is all for a good cause as all proceeds raised in this event goes towards The Stop Community Centre’s critical food access and community-building programs. This year alone over $200 000 was raised for The Stop Community Centre which will go towards their programs such as their drop in meals, healthy food banks, perinatal programs, community advocacy, local food markets, community cooking programs, sustainable food systems education, community gardening programs, and their state-of-the-art greenhouse and compost demonstration centre. To break it down even further, the $100 ticket purchase will provide our neighbours with either access to 20 meals in The Stop’s drop-in meal program, healthy food hampers for 4 families from their food bank, or increased access to their urban agriculture, community cooking, and education programming for children and adults in our community. Beyond the philanthropic initiative, you will definitely get your moneys worth in terms of food and drinks. I have never been so full in my entire life after the night was over and for all the food and drinks I devoured, the bill at the end of it all would have easily been way over the $100 price tag. The pictures you are about to see below is every single dish and beverage I personally ate and drank at this event! By the end of this visual depiction, you will likely see why I got my money’s worth and then some. My favourites of the night go to the dishes from Sea Witch Fish & Chips, Mad Maple, Enoteca Sociale, Cafe Bar Pasta, and Rose & Sons. As you can imagine after seeing everything that was consumed, there is definitely no food or drink shortage here at The Stop’s Night Market. I also loved the fact that many of the vendors used local designers to create their one of a kind food carts which really showed off the chef/restaurant’s personality. Now that The Stop’s Night Market is on your radar, mark this food festival in your calendar for next year and help support a worthy cause all the while eating and drinking till you physically can’t do it anymore. To end, I’ll leave you all with some words of wisdom for this event. Eat an extremely light lunch before coming to The Stop’s Night Market. Do come with a hungry stomach to capitalize on the monstrosity of the sheer amount of food and beverage choices you will have. You’ll thank me later.